A tub surround wall panels kit installed in mobile homes and site built homes bathtub walls are a fast easy inexpensive way to cover up ugly bathroom tub walls. Tub surrounds work where you have tubs with showers or without showers. Shower door kits can be easily installed after the wall shower panels are installed to finish off you bathroom wall. When it comes to tile vs. tub surround I find that the average person can easily install a tub surround panel kit without the problem of grouting and for a lot less expense. Tub wall enclosure kits are easier to maintain and clean than tile. 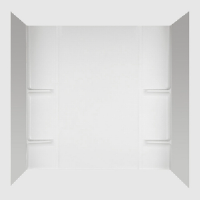 The bathtub wall panels can be plain or have niches for soap, shampoo and towel holders. Tub surround wall panels come in a variety of colors to match the tub. I first wrote an article in my mobile home repair tips blog in response to an email I received. The large viewership of that page prompted me to add this page that give more of an explanation for an easy bathtub wall panel repair idea. Preparation is everything when it comes to the tub surround install or wall repairs. Installing a tub surround requires that certain things be done before installation. The surround kits come in 3-5 piece sections. First thing is to look at the wall and inspect it for any damage that may hinder the installation and second to check for mold. If there is a lot of damage to the sheetrock around the tub that would prevent a good adhesion of the surround kit it may have to be replaced. If you do replace it I suggest using the green colored mold resistant sheetrock. Now remember that the sheet rock you install doesn't have to be completely taped, mudded and sanded to install the kit. You only need and good clean smooth surface for the surround adhesive to affix properly. You can even use 3/8" sheetrock if your local code allows it, nothing heavy or thick is required. Mold is going to be the next thing to take care of before an install of the tub surround wall panels. You can clean up mold using anti microbial bleach, your paint or home improvement store will have this. After the mold is all cleaned up and you have scraped out all the moldy caulk I recommend you paint the wall with a mold inhibiting primer paint before installing the kit whether you replace the wall sheetrock or not. Installing the homes wall panels is a simple as following the how to install instructions provided with the kit. You will probably need to cut holes in one end panel to slip over the water valves and tub spigot after you have removed the knobs and tub faucet, which should just unscrew. Carefully measure the distance up from the tub and over from the corner of the wall where the end panel will touch the back wall. I made a template from the back of the box that the kit came in and then after making any adjustments use it to trace your holes on the end panel before you cut. You can cut the holes out with a good razor knife. Do a dry fit before applying any adhesive to check for alignment. Use only adhesives made for tub surrounds, anything else will bleed through. What I do is to use painters tape to first position the tub surround panels for a fit and leveling then make marks with a pencil before I even think about making any cuts or applying the adhesive, especially if it is a 5 piece tub surround kit. Finish it off with some quality mold inhibiting waterproof silicon caulk. Now step back and look at a beautiful shower enclosure job well done that will enhance your homes look and protect the walls from mildew and rot. If you need help with any plumbing repairs during installation please look at the plumbing repairs page. Here is the best place to get Tub Surround Kits. Don't forget to order the proper adhesive and caulk!